Robert Kołodziejek is 16, he is a high school student in Koszalin. He never did any sports. He attended physical education lessons only in the first four grades of elementary school, then he had to quit. Computer games replaced football, running, cycling. All because of a faulty hip. From his birth he could not move freely, let alone play sports. He lost his parents very early. His mom died when he was three years old, his dad - when he was nine. He lives with his grandmother, they look after each other. Computer games could only go so far in compensating for actual movement. However, an unexpected change has recently occurred in the life of the teenager. We owe this in part to educational reform. Grammar school and high school students started having classes in a shared building. Robert was walking on his crutches along the school corridor when he met a physical education teacher. Jarosław Zwolak, because that's who it was, is also the coach of the famous Koszalin club "UKS Szesnastka". For years, his competitors and athletes have won medals at Polish and international events. The club occupies leading positions in the junior classification at the Polish Championships and the Polish Cup. Jarosław Zwolak has a "coaching sense" and can spot potential competitors. Many medalists owe their successes to Jarek. He suggested that Robert come to an armwrestling training. Robert has never heard of the sport in his life. He was a bit skeptical, but he took up the challenge and came to the training. He liked the classes and after some time passed, the coach and the athlete decided that it was time for Robert to take part in his first sports competition ever - the XVIII Polish Championships, which took place on March 16-18, 2018, in Cieszyn. Robert entered the disabled category, weighting 90 kg. He came second in left arm and won the first medal in his life - silver. He took the last place in right arm. Certainly yes, but there are matters more important than medals! Robert gained new friends, met people in a similar situation, got to know the "taste of rivalry", proudly represented his club. After the Championships he said that training and competing gave him confidence and helped him in everyday life. It's not only medals that count! But ... 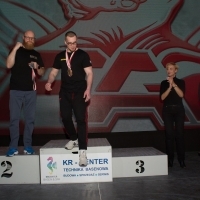 This is just the beginning of the story of Robert Kołodziejek - armwrestler from Koszalin! It is surely to be continued! Greetings to Robert and his Grandmother and Coach Jarosław Zwolak.